Learn how to turn audio from radio, podcast and print interviews into powerful visual content for your social platforms and websites. This course is also available as part of newsrewired+. Get a ticket for the workshop and our newsrewired digital journalism conference on 6 March 2019 in London here. Audio is one of the most powerful storytelling formats - but because it isn’t searchable, your audience can struggle to find your best content. This intensive one-day workshop will teach you to combine audio from interviews and promos with images, video and graphics, and boost the visibility and reach of your stories across your social platforms and website. You’ll learn to create audio-visual multimedia quickly and affordably using free and low-cost smartphone apps and desktop tools, and how to optimise and format visual stories for Facebook, Twitter, Instagram and YouTube. You’ll also receive expert tips on apps and equipment to create and share audio-visuals with your smartphone, so you can start promoting your show while you’re still on location. 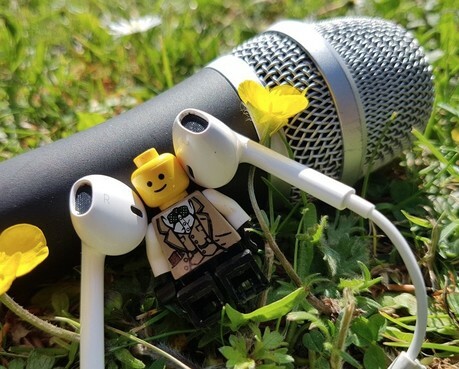 This workshop has been particularly designed for radio journalists and podcasters who need to get the greatest possible value from audio interviews and presenter content across all digital platforms including websites and social platforms. It is also perfect for print journalists and PRs from NGOs and small business who record interviews regularly and want to get the greatest value from this content. Please bring your smartphone, smartphone charger or power bank, and smartphone headphones. You should also bring a laptop and mouse. If you don’t already use an audio editing software program, please download and install the free audio editing software Audacity for your Windows or Mac laptop. You’ll be given a short introduction on how to use it during the workshop, and detailed resources to support your post-workshop learning. A sandwich buffet lunch plus tea and coffee is included. This course takes place at Thomson Reuters, 30 S Colonnade, Canary Wharf, London E14 5EP. Corinne Podger lectures in Digital and Mobile Journalism at the University of Melbourne, Australia’s top university. She also consults globally on mobile journalism, social media and digital strategy and her recent clients including the Asia Pacific Broadcasting Union, Thomson Reuters Foundation, the Reuters Institute for the Study of Journalism, Trinity Mirror / Reach plc, the Financial Times, the World Association of Newspaper Editors, the International News Safety Institute, the World Health Organisation, the World Federation of Science Journalists, the European Commission, International Fund for Agricultural Development, and Price Waterhouse Coopers. Corinne has worked as a journalist for over 30 years across radio, TV and online, primarily for the BBC World Service and Australian Broadcasting Corporation. She writes about tech and future of news for the European Journalism Observatory and the International Journalists’ Network, and speaks regularly at conferences including the International Journalism Festival.